In a worrying sign, an Indian living in Oman has been found to commit suicide every sixth day, owing to financial stress or personal issues, official data shows. 23 Indians had committed suicide in different parts of the Sultanate till mid-April this year. In January and February, eight Indians committed suicide in each month, while four ended their life in March. Three people had committed suicide till mid-April, Times of Oman reported, quoting data available with Indian embassy in Muscat. Last week, an Indian mother of three was found hanging from the ceiling at her flat in Ruwi region. 50 Indians committed suicide in Oman in the year 2010, while another 54 in 2011, the report said. Psychologists and social workers in Oman call this an alarming phenomenon. “Even though the number of suicides was slightly low in March and April, it was quite high in January and February,” an Indian lawyer told the paper. The reasons behind the suicides, psychologists say, are either financial stress or personal issues such as low self-esteem, depression and interpersonal conflict. Several Indian social and spiritual groups are working in Oman to prevent the rising number of suicides. “The reason for the high number of suicides could be the lack of someone to confide in,” P M Jabir, Indian Social Club Welfare Secretary, said. “Many of the victims are people who are living away from their families and relatives, which lead to loneliness and stress. Also, most of these people might be undergoing tremendous financial crisis in fulfilling the family obligations back home. “To overcome all that, they seek easy methods like taking loans from private money lenders, which later turns into a death trap,” he said. A senior Indian embassy official said the mission is ready to provide help to Indians who are under stress. “A dedicated Community Welfare Wing, headed by a senior India-based officer, caters exclusively to the needs of distressed Indian workers,” A.P.S. 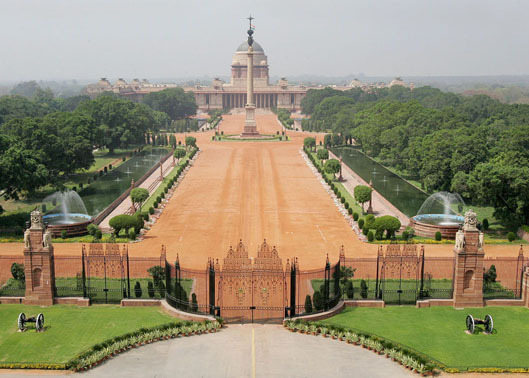 Chauhan, Second Secretary (Community Welfare, Culture and HOC) at the Indian Embassy, said. 984u FM is doing a great job. Almost all mobiles have FM Radio. One plus would be to get a stronger transmission to get a stronger reception on the mobiles eliminating static. 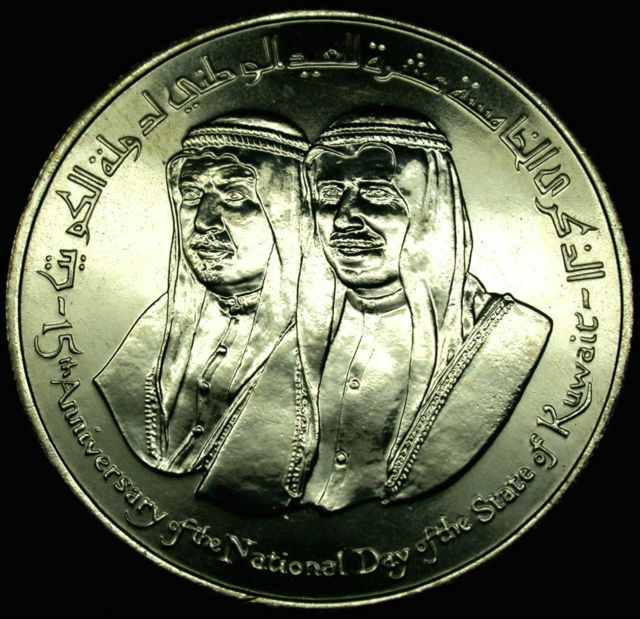 Kuwait issued this silver 2 Dinars coin in 1976 to celebrate the 15th anniversary of their independence from Great Britain. 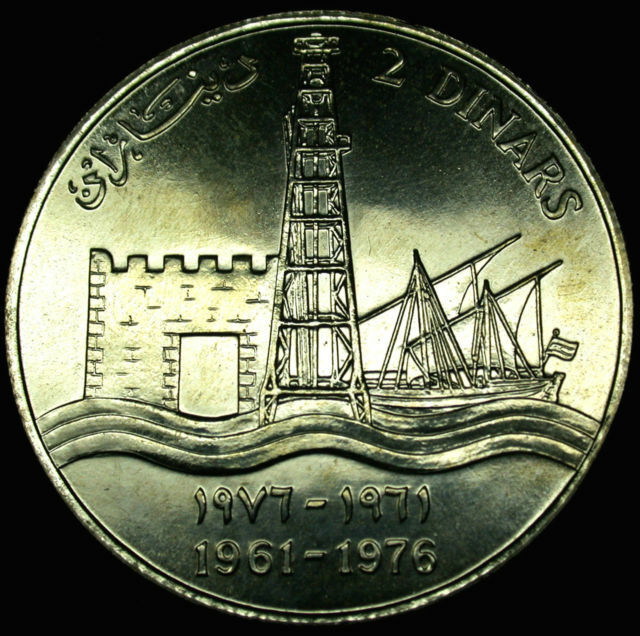 Pictured on the obverse are Abdullah ibn Salim, who was Emir at the time of independence, and his half-brother, Sabah Ibn Salim, who succeeded him and was Emir at the time the coin was struck. The reverse pictures an oil well, the main source of wealth of the country, a dhow, the traditional sailing boat used in Kuwait and throughout the region, and an old fort. The 38.5mm coin has a mintage of only 70,000 pieces and is Uncirculated. The mentors of people who write ‘cud’, ‘lolz’ and ‘tnkx’. These are the people who killed grammar & punctuations. The news of an entire unit of mechanised infantry inclusive of its fighting vehicles moving towards Delhi from Hisar has sent shock waves throughout the government and has threatened to tear the very fabric of our evolved democracy. Online sites have been going berzerk with supposed Conspirators ranging from the General VK Singh, the RSS and Mayawati. 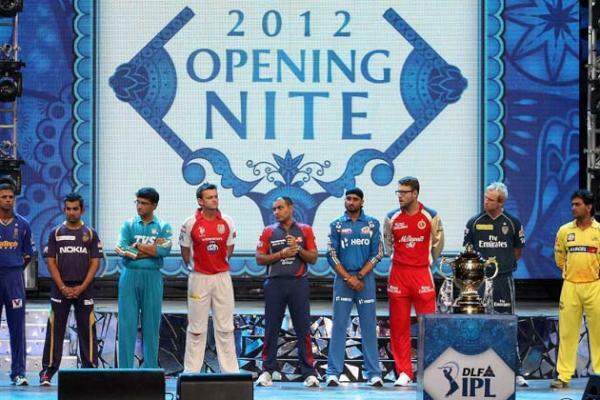 India TV has gone on to accuse the producers of Agent Vinod of this publicity stunt. Confirmed sources tell us that an attempt had indeed been made, India had been periliously close to an army rule and Manmohan Singh becoming just a silent ceremonial stooge. Much to our chagrin and later pride we have learnt that this attempt of the army was stalled neither by the Defense ministry, nor the Judiciary, It was a brave effort by a Haryana police constable that ensured that the air you are breathing as of now is a democratic one. We have given below excerpts of a recorded conversation between the army commander Lt Gen Ak Singh and Suresh Tokas the constable at the road blockage outside Najafgarh. Constable: Naaaa… Tere ko bhi nahin jaanta, tere baap ko bhi nahin jaanta.. Abey Roz paala padtha hain Dilli ke londo se.. Yo sab kahin aur jaake boliyoh..
Constable: Matbal.. Gen Saab..aap meri baat samjhe nahin… Aap jaayengey Dilli, Ban jaayege bade aadmi, Hum toh yahin isi Roadblock ki duty kar rahe honga na..
Gen: Dekho Constable, iam giving you 15 seconds to remove this blockade.. otherwise ill have to order to forcibly remove you guys..
Gen: 15, 14, 13, 12, 11, 10, 9,8,7….. Orderly: They want us for rescue operations..
We got in touch with eminent personalities from various fields and asked them their opinion on Constable Suresh Tokas.. While we expect the whole country to rejoice the arrival of this new hero, political parties to fall over each other to incorporate him into the party, Tokas was last seen trying to haggle with a couple caught making out. Even as we were going into print, Mahesh Bhatt, Suhel Seth and Arundhati Roy remained unavailable for comments. Found this garbage can written infection. Strange I thought. And the Indian HRD Minister does not know the difference between MegaWatt and MHz. This is a NDTV image grab, just before they altered the text. 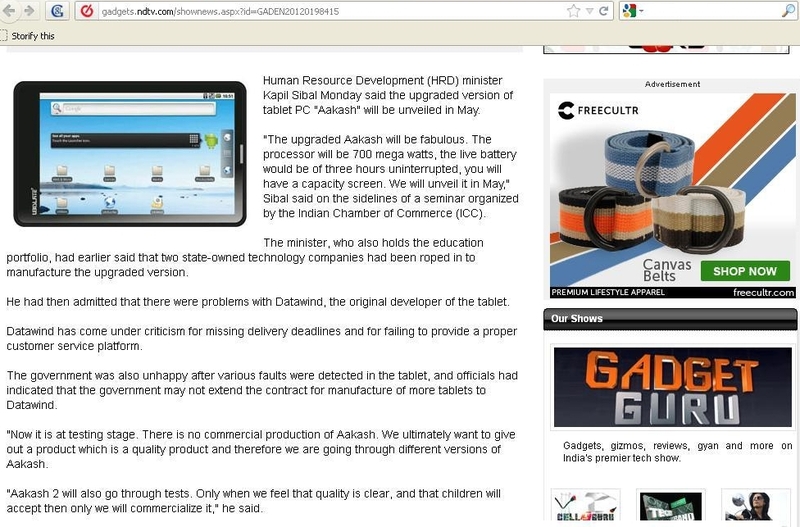 Indian Kapil Sibal, HRD Minister confuses between MegaWatt and MHz.